Where the hell we can enjoy a delicious beef steak, padded with fitting taste on the tongue, portions were jumbo at affordable prices? Ahem, the definition of affordable price that is approximately no more than one hundred thousand dollars Seporsinya. In Jakarta there are several restaurants that became the target of hunters steak with the criteria I mentioned above, for example Abuba Steak, Andakar, or Hollycow. Well for Andakar I even once wrote his review here. The other two, I did not show it in the AAC, but I recommend you try if you want to taste it. In Hollycow you can choose the type of sauce that is used if the black pepper, mushroom or barbeque. While Abuba Andakar and they only have one type of course is barbeque sauce. I show some steak recipe ever before and everything is easy to make, but two weeks ago after work I so want to eat meat that is thick steak with black pepper sauce kick. For that moment I was then stranded in a supermarket and started to look around price cuts of beef that was able to make my breast stroke. Why yes in an agricultural country with vast land and fertile soil such as Indonesia does not have a lot of beef cattle farms that can supply the needs of domestic meat? As I recall two years ago the price of beef is not shifted from one hundred thousand dollars per kilo. Lazy to linger in front of the meat counter, my choice finally fell to the top side of meat types. To measure 425 grams I had to spend fifty thousand dollars. I know for a grilled steak that just use a flat pan on the stove, the quality of the meat is good to be decisive, so that the meat tender though only baked quickly in a short time. But good quality meat is expensive, so this time I just use a type of meat with mediocre quality, but with proper treatment, the meat can be tender equally with the type of the superclass. Arriving home, the clock has six o'clock, I was immediately plunged into the kitchen. I remember a few tips to make the meat tender piece of meat is to soak in lumatan kiwi fruit (they're expensive and I often complained readers if advised), wrap with papaya (papaya tree in the front yard of new growth as high as 20 cm), using papain powder (papaya latex is sold in supermarkets in the form of white flour) or grated pineapple. My choice fell to the pineapple, and incidentally I always keep it in the freezer fruit pieces. Based on experience, including pineapple frozen fruit and is usually okay for me to use it as a fruit and vegetable smoothie mix that often I make in the morning. A quarter of the pineapple fruit, about 150 grams I briefly blender until smooth and I used to soak the meat pieces. Why pineapple effective as a meat tenderizer? Pineapple contains bromelain, a compound mixture of the protease enzyme that has the ability to digest proteins. 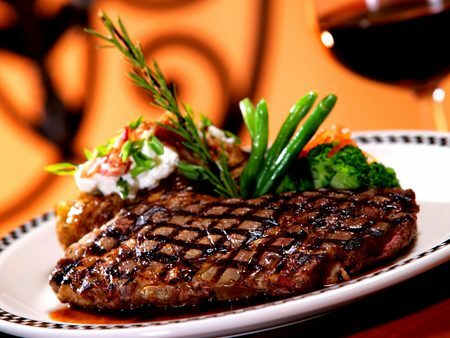 In 1890, the researchers found pineapple effective to break down proteins such as collagen present in the steak. Although bromelain is found in all parts of the pineapple fruit, but the greatest concentration found in the pineapple stem. In a pineapple canning factory, after the meat cut pineapple, in kalengkan or converted into juice, then the remaining part of the fruit is then collected for its bromelain extracted. Because the efficacy of bromelain in the pineapple in mengempukkan meat, so be careful when you dampen the steak pieces in it. Do not use an excessive dose of pineapple and do not immerse it in a long time, because instead you will get a piece of steak soft nan then there is mush meat will not taste right. Based on experience and trial error had been so for 500 grams of meat you can use 1/4 pineapple fruit weighing about 150 grams grated or in a blender. Rub entire surface of meat with grated pineapple and soak for 20-30 minutes. You will find the texture of the meat before and after immersion will look different. Bonding network in the meat that was compact and dense will look stretched and loose. The longer you soak the meat will disintegrate into fragments. Immediately wash the meat thoroughly and prepared meats marinated in herbs marinade your favorite. Or you can simply soak the pieces of meat with grated pineapple and spice marinade in a single occasion, of course if you do not mind the slightly sour taste of pineapple. Nothing is more delicious than eating a piece of steak that tasted like meat. I mean marinade is not too heavy and totally change the flavor of the meat. Usually steak a la Western just mashed seasoned with pepper and salt. Asian tongue I certainly would revolt with simple seasonings like it, because it's me add a few ingredients such as soy sauce (soy sauce), soy sauce English, finely chopped garlic, and soy sauce. You can soak them for at least 1 hour or 1 night in the refrigerator to marinade sauce is really pervasive and prepared meats in pan fried on the stove until cooked. Tips for grilling steaks process by using a pan on the stove: Make sure you use a pan really hot conditions. The goal when the meat attached to the surface of the meat in the pan then immediately baked and form a layer that locks so that the broth meat juices do not flow out. The resulting steak will be dry on the outside but juicy and tender on the inside; Thick pan that will give better results because more heat stable, not easily made ​​into a charred steak and providing the opportunity for a perfectly cooked steak to the inside; Another tip I usually use a steak with a thickness of less than one centimeter, the reason it is getting increasingly thinner pieces easily cured, but it turns out with the marinade pineapple chunks over one inch thick can be perfectly cooked and tender; Grilled steak with a fire that is not too large in order steak cooked well. Let us look at the recipe and process. Creamy Mashed Potato: Let's make mashed potatoes Laziz a la restaurant! Prepare beef, I use this type of top side. Put the meat into a transparent plastic. Pour pineapple that has been shredded or blended until smooth. Shake the plastic until meat smeared with pineapple well. Tie tightly in plastic and put it into the refrigerator for 30 minutes. Note: Do not soak the meat in the grated pineapple too long, because the enzymes in pineapple help flesh becomes decomposed and quickly padded, too long will make the meat to be destroyed. Remove the meat from the plastic, wash the meat thoroughly. Prepare a small bowl, put all the ingredients shredded. Put the meat, turn up all the parts smeared with good seasoning, using the tip of a knife or a fork prick-prick the surface of the meat to allow the flavors to infuse. Cover the bowl and let the meat in the marinade seasoning at least 1 hour, up to 1 night in the refrigerator chiller. Or you could also store them in the freezer for a longer shelf life. Remove the meat from the refrigerator, drain off marinade. Do not waste the rest of soaking meat seasoning, we will use it for the sauce. Prepare a flat non-stick pan, the thicker the pan you use will produce a good steak with cooked because heat stable and evenly. Pour 1 tablespoon margarine or cooking oil, cooking oil, but I use margarine will give more aroma and delicious taste. Heat the pan until really hot. Put a piece of steak, cook over low heat until one side of the parched and brown. 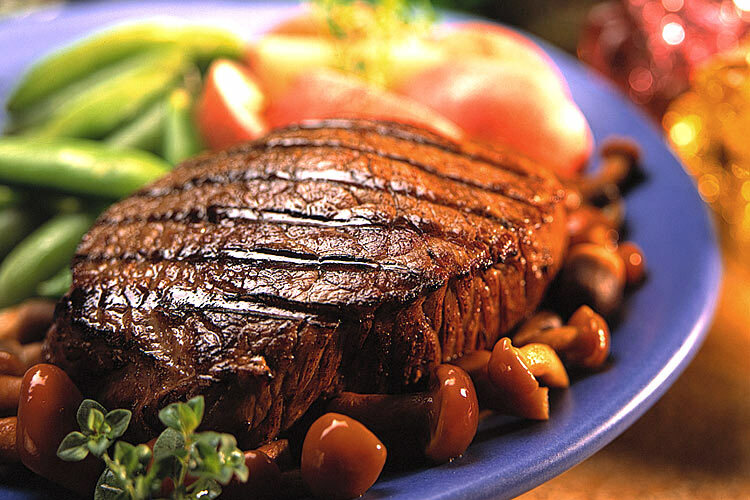 To prevent the oil on the surface of the pan is not covered steak burnt and charred, shear-shear steak over roasted until the entire surface of the pan with iron tongs or spatula. Check the bottom of the steak before you turn it over, make sure the surface of the steak looks brown and burnt. Turn the steak and cook the other side until done. It did not take long for the steak to mature to the inside, so do not cook it too long. Lift the steaks and place on a serving plate. 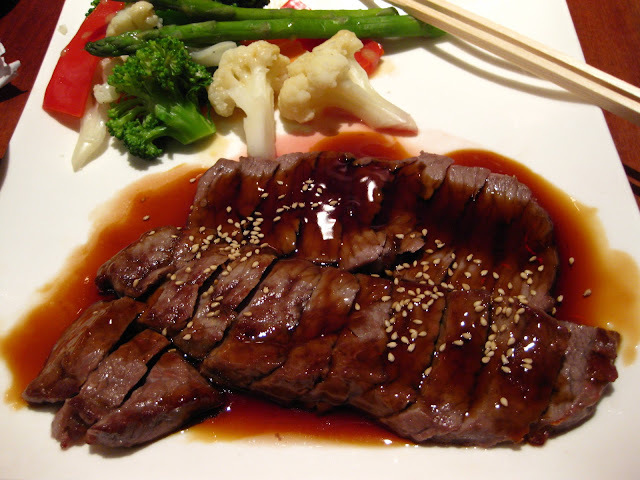 Prepare a frying pan frying steak former, give 1 tablespoon margarine. Saute onion until wilted, transparent and changed to brown. Add the garlic and saute until fragrant. Pour the oyster sauce, soy sauce, stir and cook over low heat until fragrant and the smell of cooked sauce. Add broth (if disposable, if not use plain water), instant bouillon powder, black pepper, and sugar, and cook until the sauce boils. Enter the rest of soaking meat sauce, stir well and cook until boiling, taste tastes. Adjust the saltiness or sweetness by adding sugar and salt. Enter the cornstarch solution and cook, stirring until thick. Lift. Tata mashed potato and boiled vegetables on a plate containing steak, flush with black pepper sauce. Super yummy! 0 Response to "RESEP MASAKAN STEAK DAGING LADA HITAM Beef steak with black pepper sauce, mashed potatoes and vegetable stew "